Even had it been approved, the U.S. Indian Affairs office made a less than generous offer to the Native Americans who lived here. 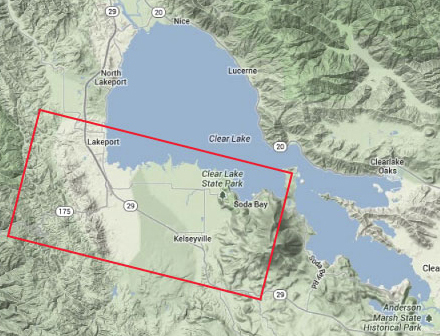 Below we've imposed a 12x6-mile area over a Google map of Clear Lake. We know that McKee briefly named the mountain we now call Konocti after himself, and have moved southwardly from the spur we now know as Buckingham point. We can find no clue to Rio Dolores, are confused by the references to the Russian River, Eel River and Sacramento River. 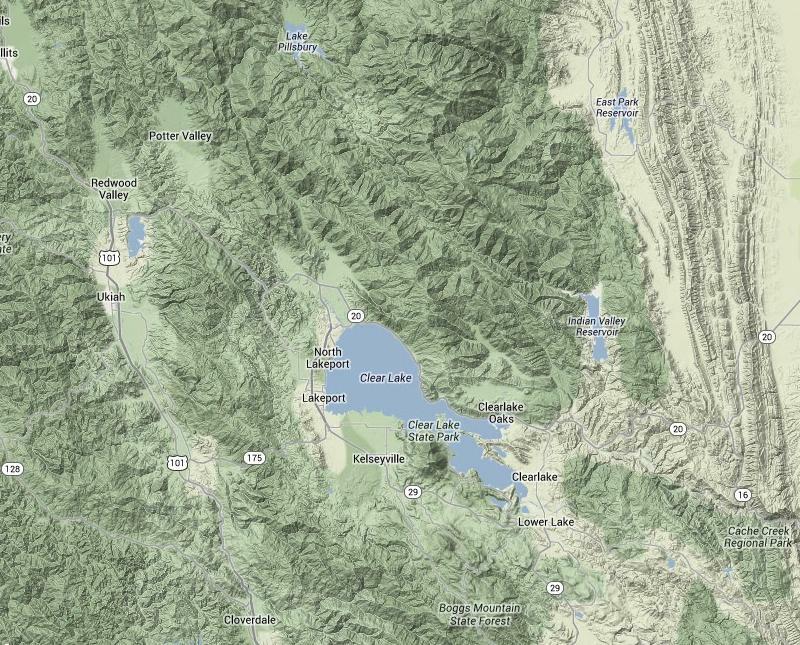 Did the boundary extend west to the Russian River, which loosely parallels Hwy 101, and north to the Eel, which created Lake Pillsbury? What do you think? "...the following tract or district of land shall be appropriated and set apart as an Indian reservation, and the use and possession thereof forever guaranteed to the said tribes, their successors, and to such other tribes as the United States may hereafter remove from the valley of the Russian river or elsewhere, and settle thereupon, to wit: commencing at a point on Clear lake, where a spur from Mount McKee (heretofore called the Chemisal mountain) juts into the same; thence along a line running southwardly over said mountain and over the hills behind the same to the summit level of the mountains dividing the Clear lake valley from the waters of the Rio Dolores; thence westwardly along the same and along the summit of those dividing said valley from the waters of Russian river, to where said mountains meet those dividing said valley from the waters of Eel river; thence along said ridge to a point where said last-mentioned mountains meet those dividing said valley from the waters of the Sacramento; thence along the summit of the same to a point due north of the place of beginning; thence south to the said point. 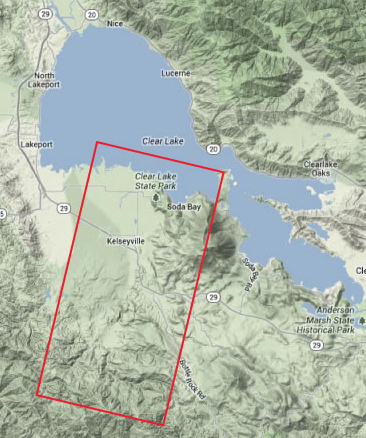 Containing all that part of the valley of Clear lake lying westward of said Mount McKee, the habitable part of said tract being by estimation about twelve miles in length by about six miles in width, together with the exclusive right of fishing in that part of said lake included within the foregoing boundaries..."